All Dorm rooms are only 4 share and air conditioned! Located 400 metres from the main street, on the top of a small hill, Backpackers By The Bay has awesome ocean views and a relatively quiet and relaxed atmosphere. Accommodation is available in four share rooms, and doubles. Linen is provided and all rooms are serviced daily. The hostel has a saltwater swimming pool which is surrounded by hammocks, sun-lounges and palm trees as well as a huge sunbaking deck. A fully equipped kitchen with crockery, cutlery and utensils is provided, as is a laundry. *Team trivia competitions with the winners receiving a bottle of champagne. Guests arriving by coach are met at the transit centre by a FREE courtesy bus, while FREE off-street parking is provided for those guests arriving by car. The friendly and helpful staff look forward to meeting you! *FREE Courtesy bus service meeting all coaches(between 7am-7:30pm). *FREE quiz for a bottle of champagne every night! *FREE Fully equipped kitchen - all cutlery, crockery, pots and pans provided at no charge!!! 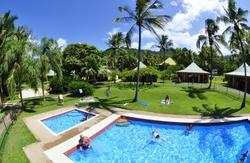 *Salt water pool surrounded by palm trees, hammocks and sun lounges plus a great sun bathing area! DRIVING:- simply drive straight through town. You will pass Domino's Pizza on your left. Continue straight through that roundabout and over the hill. You will see the hostel on your left as you come to the bottom. To reach our carpark simply take a left at the very next roundabout and we are 3/4 of the way up Hermitage Drive on the right hand side. There is a sign that clearly show's where the carparking area is. Should the carpark be full it is more than safe to leave your car on Hermitage Drive. FLYING:- To reach the hostel from Proserpine Airport you will need to catch a local Whitsunday Transit Bus. This costs $15 each way or you can purchase a return ticket for $25. You can arrange this very easy by purchasing the ticket once you land in Proserpine Airport from the ticket desk which is located at the exit gate as you leave the terminal. To reach the hostel from Hamilton Island Airport you will need to catch a ferry from the island to the mainland. If this has not been included in your flight cost (alot of the jetstar flights include your ferry transfer in the flight cost and will state this on your ticket) you will need to pay for the transfer from either Cruise Whitsunday or Fantasea. These tickets can be arranged once you land on Hamilton Island from the ferry sales desk. Once you are on the mainland there will be a local Whitsunday Transit bus. Simply let the driver know that you are staying at Backpackers By the Bay and they will drop you off at our stop. TRAIN:- +To reach the hostel is very easy. Once you get off the train you will see a Whitsunday Transit bus at the exit of the station. It costs $8.20 one way or $15.20 return. You purchase the ticket from the driver and let him know your staying at Backpackers By the Bay and they will take care of the rest.